-Medicinal garden- plant lavender, St. John’s wort, chamomile, echinacea, ginger, catnip, and rosemary. -Tea garden- mints, roses, raspberry, nettles, chamomile. -Bee/Butterfly garden- bee balm, sage, lemon balm, calendula, fennel. 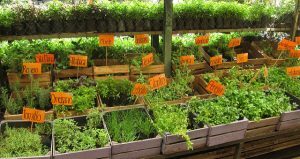 There are also ideas for a moonlight garden, a salad garden, a dyer’s garden, an insect-repelling garden, and of course, the classic culinary herb garden!